Climate change remains one of the major international environmental challenges facing nations. Yet nations have to date taken minimal policies to slow climate change. Moreover, there has been no major improvement in emissions trends as of the latest data. 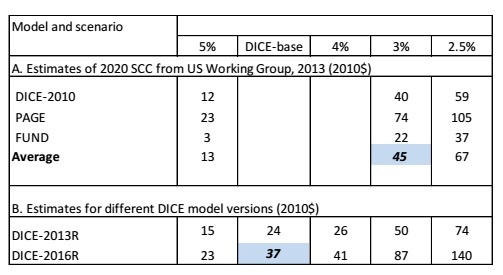 The current study uses the updated DICE model to present new projections and the impacts of alternative climate policies. 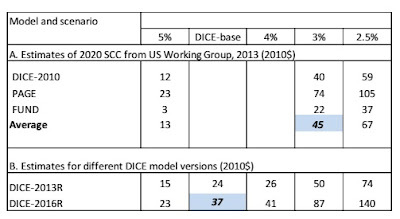 It also presents a new set of estimates of the uncertainties about future climate change and compares the results will those of other integrated assessment models. The study confirms past estimates of likely rapid climate change over the next century if there are not major climate-change policies. 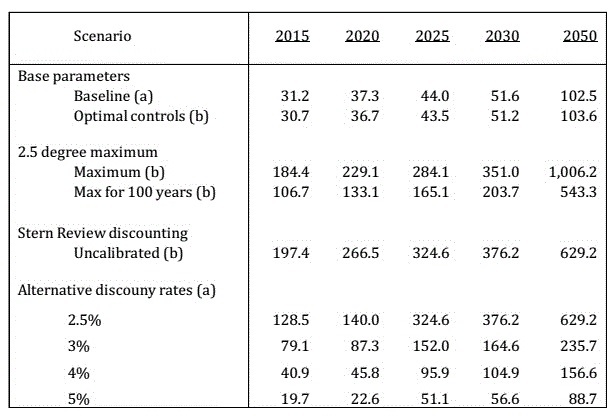 It suggests that it will be extremely difficult to achieve the 2°C target of international agreements even if ambitious policies are introduced in the near term. The required carbon price needed to achieve current targets has risen over time as policies have been delayed. There are three statistics for central values and three for uncertainty. 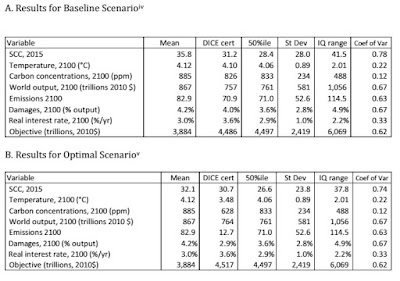 Look first at the estimates for temperature increase for 2100. The certainty equivalent (CE) for DICE is 4.10 °C, while the mean is a tiny bit higher at 4.12 and the median is lower at 4.06 °C. These suggest that the distribution is close to symmetric and that the CE gets a good approximation of the estimates with uncertainty. Other variables display considerable asymmetry in the distributions. 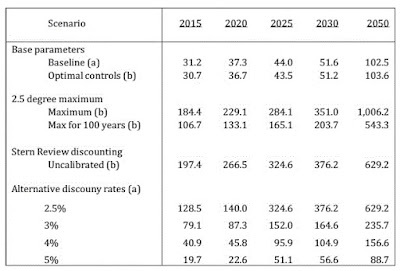 The SCC (Social Cost of Carbon) for 2015 has a mean of 35.6$/t CO2 whereas the CE is about 15% lower at 31.2$/t CO2. 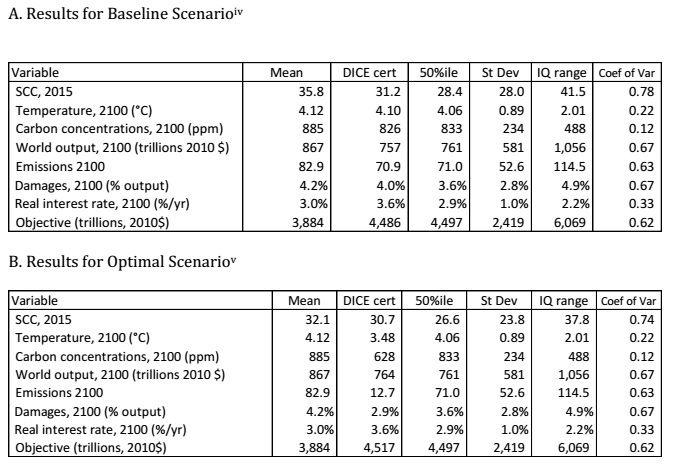 Output and CO2 concentrations are similarly skewed. The issue of whether the CE is a reasonable approximation is important because it vastly simplifies analysis. The answer is, sometimes yes, sometimes no. Appendix Table A-3 provides a tabulation of variables and the bias from using the CE approach. This is a great paper. Our only comment is that we also need to factor in the risk of non linearities such as abrupt climate change, war and economic collapse that may be triggered at a particular "tipping point" temperature rise. This may add an "infinite cost" dimension to the model.